Dynea Oy, the parent company of Dynea International Oy, is acquiring Perstorp’s resins operations from Sydsvenska Kemi. Through this acquisition, Dynea Group, a leading global supplier of industrial adhesive systems, will strengthen its position as a world-leader in industrial resins for non-wood applications. The acquired business will be owned by Dynea Oy. Dynea’s current industrial resins business is owned by Dynea International Oy. Fortum Oil and Gas, a wholly owned subsidiary of Fortum Corporation, has agreed to sell Neste Chemicals Oy to Industri Kapital 1997 fund for FIM 3 billion (EUR 505 million). Neste Chemicals managers will also become owners of Neste Chemicals Oy. The transaction is subject to the approval of competition authorities. Industri Kapital and the State of Finland have agreed in principle to combine Kemira, Dynea and Sydsvenska Kemi. In order to complete the proposed combination, Dynea will acquire the State of Finland's shares in Kemira and make a public tender offer to the minority shareholders of Kemira. The above transactions are subject to certain conditions. Dynea will pay EUR 9.10 per Kemira share. The State of Finland will receive its consideration through the receipt of 34 per cent of the shares in the new group and a consideration of EUR 100 million. Z.A.O. MetaDynea manufactures and markets superior adhesion solutions. The new company, jointly owned by two leading companies, Dynea Chemicals Oy (Finland) and JSC Metafrax (Russia), aims to ensure the availability of high quality adhesives for the manufacture of wood based panels, other wood working industries and different industrial applications. JSC Metafrax is a major producer of methanol. Its product portfolio of chemicals also includes formaldehyde, urea-formaldehyde concentrate and other formaldehyde based products. The company is based in Gubakha, in the Perm region. The company employs some 2.500 persons and has an annual turnover of over EUR 100 millions. In addition the Annual General Meeting resolved to distribute as a dividend altogether 217,963,549 Neste Oil Corporation shares so that each shareholder of Fortum Corporation receives as a dividend one (1) Neste Oil Corporation share for each four (4) Fortum Corporation shares, which have a par value of EUR 3.40 owned by the shareholder. Industri Kapital (“IK”) and co-owner Ensign-Bickford Industries have signed an agreement to sell Dyno Nobel, a leading commercial explosives company, to a consortium of institutional investors lead by Macquarie Bank for 1.7 billion US dollars. The consortium’s objective is to focus on Dyno Nobel’s North American and Australian assets and as a result it has entered into an agreement to sell certain assets to Orica Limited　(“Orica”). Macquarie will focus Dyno Nobel geographically on the North American and Australian markets and will explore a range of future options for the company, including the potential for an IPO on the Australian Stock Exchange in the first half of 2006. Consequently, Macquarie has agreed with the Australian chemical and explosives company Orica to sell to it most of the European, Middle Eastern, African, Asian and Latin American businesses. Industri Kapital (“IK”) and PAI partners have signed an agreement on the sale of Sydsvenska Kemi (“SSK”), the holding company of the leading speciality chemicals group Perstorp AB. Neste Oil is to build an 800,000 t/a plant to produce NExBTL renewable diesel in Rotterdam in the Netherlands. Construction will start immediately and the facility is scheduled to be completed in 2011. Total cost of the investment is projected to be Euro670 million. 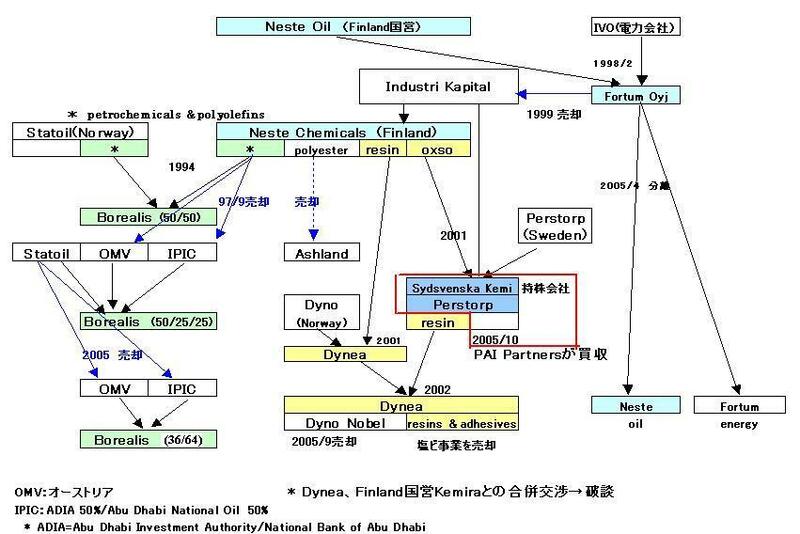 Neste Oil announced its decision to go ahead with a similar-sized plant in Singapore in November 2007. Both plants are linked to Neste Oil’s goal of becoming the world’s leading producer of renewable diesel fuel. NExBTL renewable diesel is based on Neste Oil’s proprietary technology, which can use a wide range of raw materials. In its plant in Finland, the company currently uses a mix of palm oil, rapeseed oil, and animal fat to produce renewable diesel. Offering excellent product quality - even better than fossil diesel - NExBTL can be used in all diesel engines.